If Jesus Doesn’t Know the Hour, Is He God? The answer is based in what scholars have dubbed “the hypostatic union”, whereby Jesus Christ was both fully God and fully man. He walked and talked as a man, mourned as a man, suffered as a man, yet as God He was prayed to, worshiped, etc. We could certainly do a trinity, or deity of Christ study if need be, using John 1:1 (theos en ho logos), or in John 8 (before Abraham was I am) or Isaiah 7 (Emmanuel meaning God with us). In Micah He is called the everlasting father, etc. Another example is in Hebrews 2 it states that “He was made for a little while lower than the angels.” We can infer from all this that Christ, during His earthly ministry, healed and did miracles by the father’s power, or the power of the Holy Spirit rather than His own. Therefore, having to live a perfect life as a man, He did this so perfectly or “fairly” may be a better term, that He did not know the day nor the hour. If you are looking for a less intense, down and dirty answer, we’d simply refer to Revelations, which is a go-to place to witness to Mormons as well as those who practice Islam, since the deity of Christ is often attacked. Ask, who is this that says in Rev 1:11 , “I am the alpha and omega, the first and last.” The Mormon, or Muslim will say that refers to God (or Allah they may say). Then ask, what about here in Rev 21:6, “I am the Alpha and Omega, beginning and the end.” Who is that? They will say, God. Please feel free to comment, and let me know if you have any additional thoughts in regards to this question. 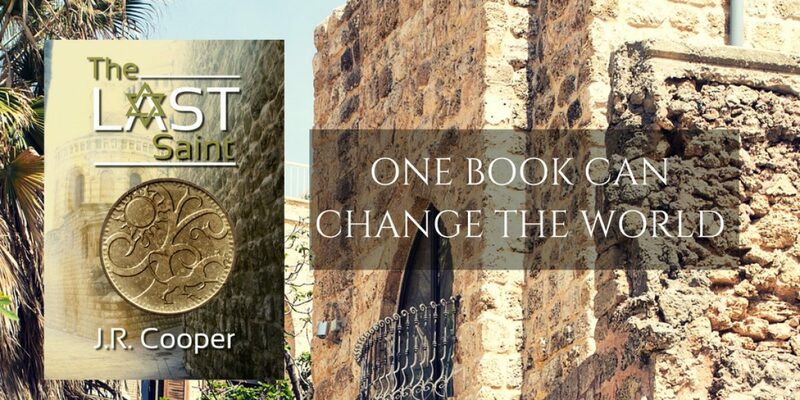 If you are interested in my Christian Fiction, The Last Saint, please check it out here or on Amazon. Author J.R. CooperPosted on January 26, 2017 January 26, 2017 Categories Apologetics, Biblical Studies, UncategorizedTags Apologetics, bible, Books, Christ, God, Islam, Jesus, Mormon, Muslim, Quran, Religion, truth1 Comment on If Jesus Doesn’t Know the Hour, Is He God? With molecules to man evolution hanging on the possibility that despite the complexity of DNA, mutations must somehow add to the genetic make up of an organism over time, the theory is truly struggling. Genetics is NOT a friend to evolutionary theory. Ignoring the magic elixir of “time” that evolutionists add to the mix in order to devise an acceptable probability ratio, we must conclude firstly that enough mutations will slowly (or quickly) transform one kind of animal into another (I sometimes can’t even believe this still needs to be discussed). A couple of short points: You have heard of a gene pool, yes? This is an invention, a constructed idea of early population geneticists who were dedicated to Darwinism. The problem they faced is that most genetic mutations aren’t catastrophic in nature. They instead degrade, and interact with other nucleotides, to create a long term minimal effect. Genes are poly-dimensional, working many different ways as a language. Imagine a book that could be read forwards, and backwards, and using every other word, and using a cipher. This is the type of complexity we encounter. It is well known in genetics that one nucleotide, since it doesn’t affect enough of the whole organism, would not be enough to be selected or mutated beneficially to bring about a change. Rather, we know that several nucleotides would have to be changed productively at once. The gene pool constructs a visual that sells well, promoting the idea that out of this “pool” nucleotides can be mutated to change the overall composition of the organism over time without consideration for those other nucleotides it affects. In other words, the ripple effect from being a multi-purposeful nucleotide would create so much “noise” and would affect the overall organism so little, that there is almost no correlation between that one nucleotide changing, and the betterment of the animal as a whole. You are talking about an almost atomic level of change. We must therefore conclude that large “chunks” must change to create any real progress. So we must analyze this possibility. Mutations within the human genome have been scrutinized and analyzed, and it has been found that most of the mutations are not “noisy” enough by themselves (changing a letter in a DNA strand, like a typo in a book) to be selected by mother nature to pass on, whether good or bad. These mutations are neutral, or un-selectable, and therefore cannot occur with enough impact to change the organism, regardless of time. Geneticists realize that most are neutral, and that because of this there would be no reason for this information to be passed on to further a species up the evolutionary chain. Furthermore, if we consider the ratio of beneficial to non-beneficial mutations, the vast majority are on the negative side. One experiment reviewed 10,000 mutations, and could only list 4 beneficial ones, which later all proved to be a net loss of information. Any that are actually considered beneficial mutations are usually in the neutral range anyway! This even further reduces the chance of benefit occurring, and being passed down. Remember, evolution requires a high rate of beneficial mutations over time to succeed. This is not observably the case on any level. There is so much more we could discuss, but this is a blog, and I just want to offer a sense of the trouble actual genetic science delivers to the evolutionary theory. Two more final notes. One is that considering that all of these nucleotides are multi-functional, if you do actually come up with a beneficial mutation that helps the organism in one way, there is no possibility that that change has also somehow benefited the way it is used in all of its other ways. It would disrupt how the information was read in all of its other variable forms, and therefore would only be beneficial in one sense, but damaging in all others. Secondly, genetics ignores in its models the very real, and very detrimental concept of “fitness valleys”. Consider this: If 99.9996% of all mutations are either bad, or neutral, and those are occurring all the time, can you suppose a timeline whereby the positive ones somehow surpass the overall effect of all the negative ones to essentially make the organism healthier and more complex? Food for thought. 1 – Early testimony – As I stated yesterday as an example, the first writings of Buddha are approximately 400 years after the actual life of Siddhartha. By contrast, the New Testament was written before 70AD, many books completed only 17-21 years after the resurrection. This adds great veracity to the historicity of the text. 2 – Eye-witness testimony – Frank teaches that after extensive study, and just as one example, if we take the book of John and Acts, therein can be found over 140 details that could only be eye-witness details. On a side note, many of these are in Genesis as well, proving the authenticity of it too, such as the verified price of a slave at that time matching Joseph’s sale price. 3 – Embarrassing testimony – Would writers of their own story include Peter denying Christ 3 times? What about the Lord they followed and loved calling Peter Satan? “Get behind me Satan.” Or would it describe how the men ran and fled, and the women stayed on the scene of the crucifixion? Or that they were the ones who discovered the missing tomb, in a time where there testimonies were not held in as high of esteem as a man’s. These are in there, not because they help the story, but because they are true. 4 – Excruciating testimony -If you have read Fox’s book of Martyrs, you know the horrible details of the brave Martyrs following Christ, and spreading Christianity to the civilized world. The apostles were boiled, crucified, even upside down, and this was the same group that days before were running away, fleeing, unsure of why they followed Jesus, and fearing the repercussions of such a choice. What made such men do a complete 180, and declare Christ even in the face of death? 5 – Expected testimony – The story of Christ fulfills hundreds of prophecies! From where He was born to how He would die. Emmanuel that was promised in Isaiah 7 was expected, and what was expected was fulfilled. For a great example, please re-read Isaiah 53. 6 – Extrabiblical testimony – We have 10 ancient non-Christian sources, such as Josephus, which describe the basic phenomenon of Christ’s story. You can conclude that even those books that are not canonized scripture agree on the historical Jesus, His plight, and His following, lending veracity once again to the true narratives about Him. For more from Frank Turek, and other great apologists, visit www.crossexamined.org. Also, he released a great book which I highly recommend called “Stealing from God: Why Atheists Need God to Make Their Case”.